Ken Nye — no relation that I know of to Bill Nye the science guy — has just started a new espresso accessories venture. 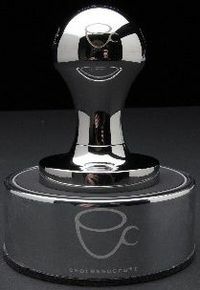 His flagship product (above) is Espressocraft's tamper: 16 ounces — 1 pound — of highly polished American stainless steel, much heavier than most professional versions. Nice paperweight even if you're a tea drinker. Nye is the proprietor of Ninth Street Espresso in New York City's East Village. There he's acquired a national reputation for expertly prepared espresso drinks. Peter Meehan wrote an article about this "Mad Scientist of Espresso" for Wednesday's New York Times Dining section.